As one of the people fortunate to get a ticket, this past Saturday I attended the first TEDxMcMasterU. A band of McMaster students brought it all together and did a fantastic job given the fact that they had to live up to the TED name. It’s great to see this kind of initiative and ambition in students. At some point during the day, in fact, it struck me that the exercise of planning a TED event is to some degree an end in itself as much as the talks are. TED events aren’t just symposia, they are happenings with high expectations. One borrows the TED name, but I imagine that it was a ton of work for the students to put this together, so again I offer my thanks for their efforts. The TED format demands, of course, that speakers leave their comfort zone–podium, laptop open, long time slot, narcotized audience, etc.–and give a TED-type talk. TED talks are about performance (all talks are performances, but TED takes it up a notch), where one must have strong command both of physical space and one’s talking points so as not to wander literally and figuratively all over the place. At TEDxMcMasterU, the speakers all gamely attempted to live up to the challenge, with varying results. Cliff Murphy’s talk on improv in educational settings was superb: good content, good self-made graphics, delivered with command and presence. Joe Kim was right up there, too, clearly a master of the medium and in command of both stage and screen. 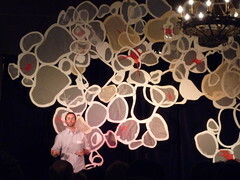 Hayden King gave a strong talk, but paced like a caged tiger. Michael Egan–a very popular history prof at McMaster, I learned–tried to cram an academic talk into a TED slot (prepared text and all), which was perhaps too ambitious. Liked his material, but it was the wrong setting. He also explained his best joke; either one gets the joke on first pass, or one doesn’t, in which case an explanation doesn’t help. Nick Rogers used Prezi and a really slick video/animation of his calculations, so kudos for that. Natalie Raso’s enthusiasm and high-wattage smile dominated the room and made everyone want to do yoga right now, I think. Really, though, any criticisms one might have were outweighed by gratitude for the speakers’ collective willingness to deal with a challenging setting. Kudos and thanks to all of them. One surprise was that I felt like an old man. I don’t think the event was publicized much beyond student circles, which was fine since it filled quickly anyway. Would have liked to see more faculty and staff in attendance, though, if only so that they could see the talent on display. Last, but far from least, major congratulations to David Ogborn and the McMaster Cybernetic Orchestra as well as Moist Theatre. The Orchestra gave a brief but compelling performance that stoked my curiosity about this musical form. Moist’s members acted as an emcee collective and did several skits that were stellar displays of improv talent. It was a true 64-bit performance, not some lame 16-bit hack job. Had to be there to get that. As someone new to Hamilton and McMaster, this was a perfect event to give me a sense of what’s going on in this community, and I liked what I saw.